The “Banner Blindness” that consumers demonstrate when exposed to traditional display ad formats is the reason that content marketing and sponsored content exist. This shift has driven digital publishers to deploy new, more effective ways to earn advertising revenue and keep users engaged and entertained. Digital publishers have successfully transitioned their reliance on IAB display ad formats to private content exchanges that provide both the content experiences, as well as an advertiser pool. Last year, a statistic from The Atlantic, reported by Digiday, indicated that 60% of the company’s revenue was driven by content sponsorship and that was estimated to grow to 75% in 2017. The reason for the growth in sponsored content is because the advertiser’s ROI was much higher, which drove more ad spend. This is largely because the content is by nature informative, entertaining and engaging, all of which ends up keeping users on site longer and creates authentic connections between the publisher, audience and advertiser. Let’s fast forward to 2017. Most, if not all, digital publishers have in some capacity had experience with using video content as a medium to generate engagement and new ad dollars. Top media sites typically feature video as a prominent “Gallery” area or within a specific section of the homepage. Smaller websites have a more disparate approach because of the difficulty in creation of video content: sourcing talent, writing scripts, shooting the video, editing and post-production; none of this is as simple as writing a new article for a blog! Traditionally, video content has been monetized with pre-roll or post-roll advertisements. While advertisements like this fetch premium price, their effectiveness and limitation to “branding” campaigns are potential downsides of the format. More importantly, these forms of advertising are also “blockers”, meaning the reason the user is even on the page in the first place is for a different reason than to watch a 15 or 30 second ad that “blocks” what the user is trying to get to. So how do we solve this issue that both encourages users to engage with the ad, without exhausting resources for the publisher? 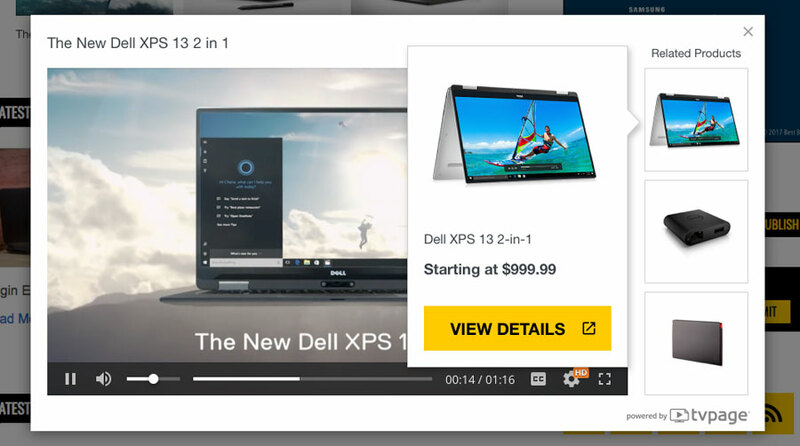 One solution launched at TVPage, one of the first providers of cloud-based video technologies, is the “Right-Rail” Video Commerce Ad unit: a non-blocking, hyper relevant product offer related to the video content the user wants to watch. Through this type of advertising, publishers can leverage new or existing video assets to deliver relevant product offerings related to the video. This means that the entire inventory of video players deployed on digital publisher websites today, is ready to accept this new ad format. The “Right-Rail” unit is attached to the right side of any existing video player and can also be deployed as an overlay that displays relevant product hotspots at certain moments in time during the video. This is ideal for educational, how-to and even entertainment video content. This unique take on video monetization comes at a very important point in time. Advertisers are paying more for traffic and getting less, which primes the stage for a new, more engaging ad unit that is both relevant and contextual. The important part to any solution here, including the “Right Rail” and beyond, is that it is easy to reach monetization at scale quickly across thousands of video players.